My CPU got fried again. It was pretty old, and I have replacement hardware lying around, so it's not a big loss. The last time it happened (like 2 years ago), I forgot to mention that I want the dead CPU, so they threw it away. Not this time! 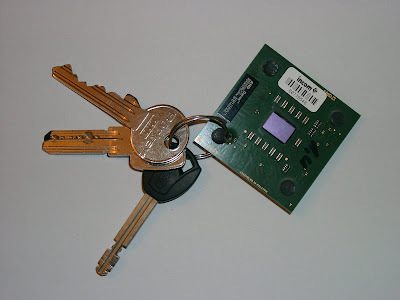 That's something that I always wanted to have - a key fob made of my own CPU. I used plain drill to make a hole. I made it in a place where there was no pin. That wasn't the best idea, as the hole is far from the edge, and it's harder to pass the keyring through it. If any more CPUs fry at me, I'm going to remove a pin near the corner and make a hole there. 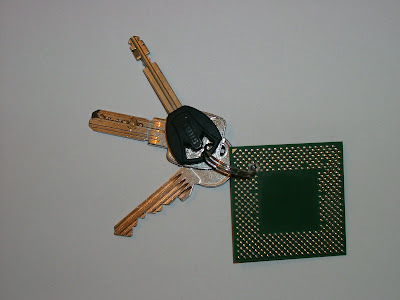 My keychain is half a 16MB SIMM. Looks pretty neat Taw, so you get any comments about it in IRL? There's no chip with 64 outputs so you need to do some small design on your own. The easiest way of making 6-to-64 decoder is using nine 3-8 decoders with enable. Let's say your inputs are I0 to I5, and your outputs are O0 to O63. Take one decoder (let's call it E) and connect I3 to I5 as its inputs, and let's call its outputs X0 to X7. Then take eight more decoders (D0 ... D7). For all of them connect I0 to I2 as its inputs, and one of X wires as enable. So D0's enable is X0, D1's enable is X1 etc. Then D0's output is O0 to O7, D1's is O8 to O15 etc. You can use enable of E as enable of the whole 6-to-64 decoder. Depending on particular chips you might need to negate some wires. I0 to I2 are used as input to 8 pins, what should be fine in 74LS, or CMOS, but check your specs. Examples of 3-to-8 decoders with enable are: 74LS42, CMOS 4028. 3-to-8 decoders with enable chips are often "4-to-10 decoders". Simply treat their I3 as negated enable, ignore their O8-O9, and you'll be fine.